2. Rotate to select Text Message, then press . 3. Rotate to select a message, then press . - The text message is displayed. The system automatically starts reading the message aloud. The icon appears next to an unread message. Only the first three lines of the received message are displayed with this option. If you delete a message on the phone, the message is also deleted in the system. If you send a message from the system, the message goes to your phone’s outbox. 4. Press to enter the Text Message Menu. 5. Rotate to select Stop Reading or Read, then press . This option changes to: • Stop Reading while the text message is read out. 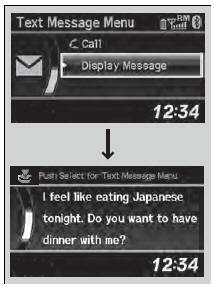 Select this option to discontinue the message readout. • Read when you go to the Text Message menu, or after you selected Stop Reading. Select this option to hear the system reading out the selected message. You can reply to a message using one of the six common phrases available in the system. - The text message is displayed. The system automatically starts reading out the message. 5. Rotate to select Reply, then press . 6. Rotate to select the reply message, then press . 7. The reply message you selected is displayed. Select Yes to send the message. • Talk to you later, I'm driving. • I am on my way. • I'm running late. You cannot add, edit, or delete reply messages. You can call the text message sender. 2. Rotate to select to Text Message, then press . 3.Rotate to select a message, then press . 4.Press to enter the Text Message Menu. 5. Rotate to select Call, then press . 5. Rotate to select Display Message, then press . 6. Rotate to scroll down and display the entire message.